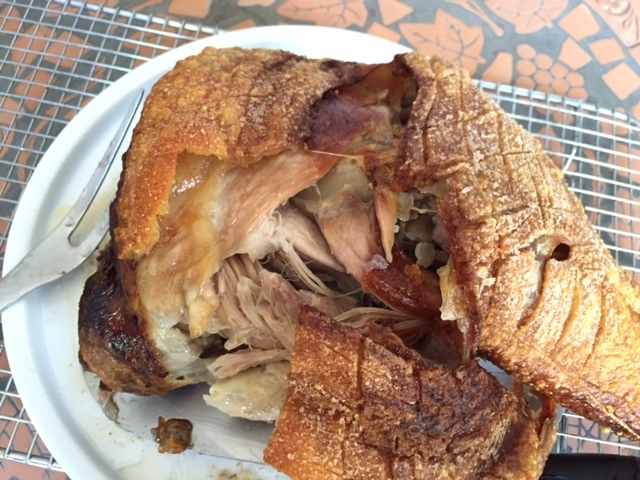 Pork with perfect crackling – for Feast Wisely’s 2nd birthday! Last week I celebrated Feast Wisely’s second birthday. Over the last two years I’ve enjoyed sharing over 150 posts covering recipes and restaurants. And of course I’ve enjoyed all of the eating this has entailed. I’ve also learnt a lot along the way. Reflecting back the most valuable piece of advice I received early on was to be consistent – both in terms of frequency of posting and the theme of posts. For me consistency comes from planning ahead and then making the time to stick to the plan. Despite ambitious goals of posting twice weekly I’ve now settled into a more manageable pattern of one post per week. This leaves me with plenty of free time to read other foodie blogs and to focus on the quality of my writing. 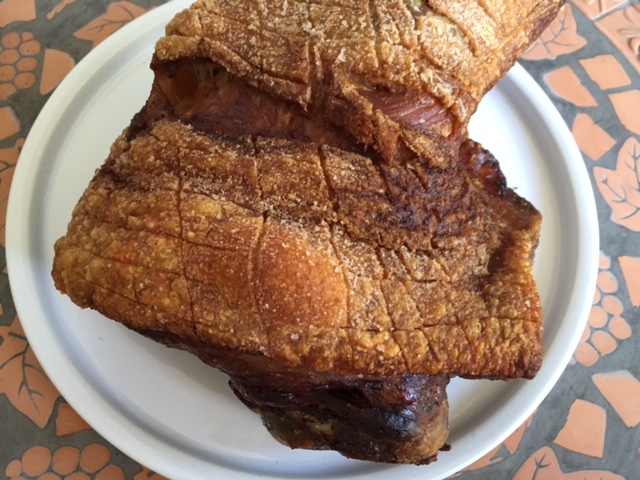 Over the last two years one Feast Wisely post stands out a mile in terms of visitors – my recipe for slow cooked pork shoulder with perfect crunchy crackling. Week in week out it’s the most popular page on Feast Wisely and every Sunday the number of views spikes – in line with the traditional Sunday Roast. At the moment I have my mum here in Australia, visiting from the UK, so my writing (and cooking) time is more constrained than usual. 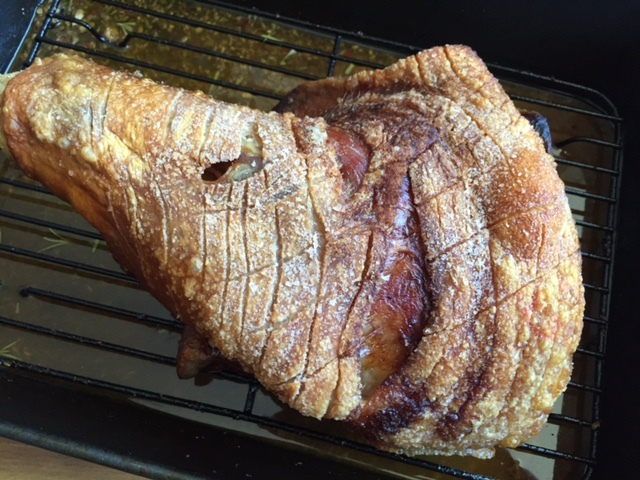 So today I decided to share photos of my latest pork shoulder roast – from Christmas Day 2015. It was my most successful yet – and of course the leftovers lasted for days. I buy organic pork shoulder from my local butcher and always choose one with the bone in. The pork you see here weighed around 2.5kg and would provide a generous serving for 6-8 people. 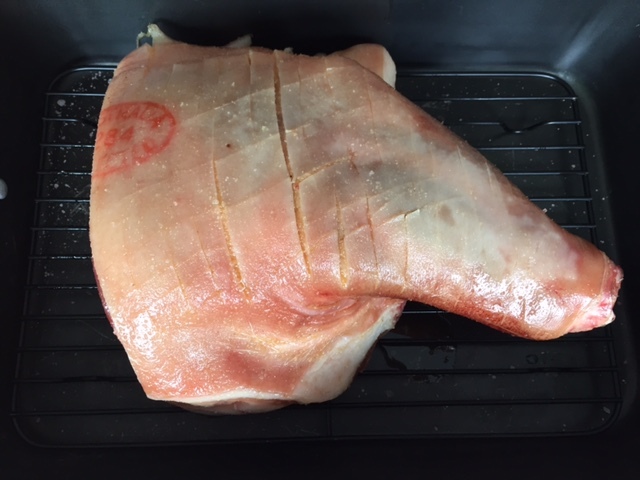 It’s best to salt the pork skin 24 hours before cooking and then store it in the fridge. I cooked the pork for 30 mins on 250C (to get the skin crackling) and then turned down the heat to 130C for another 6 hours or so. It remained uncovered the whole time. When preparing such a big piece of meat it’s always best to remove it from the fridge 1-2 hours before cooking. As you can see the skin had crackled perfectly and the meat underneath could be easily shredded with a fork. Pork heaven. If you have any other tips I’d love to hear them….. 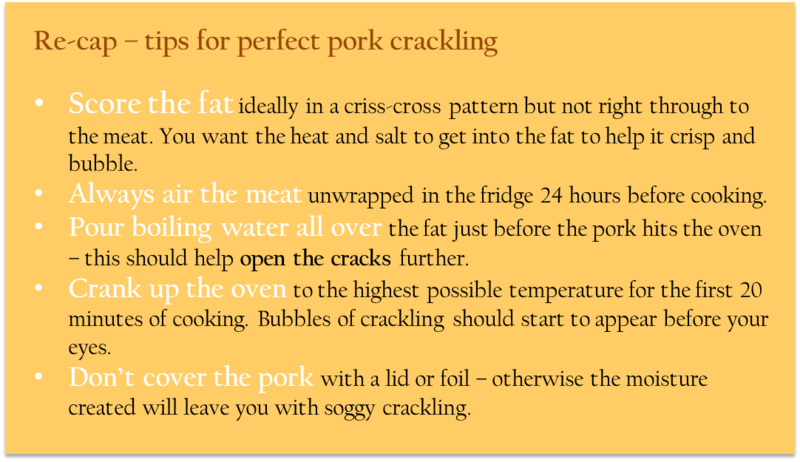 Tags: crackling, pork, recipe, shoulder, slow cooked. Bookmark the permalink. Happy (late) second bday to your blog! Please keep the recipes coming!! Thanks Laura – and yes I’m hoping for many more delicious years ahead….. Thanks Linda – appreciate it! Happy blogiversary! The pork looks amazing!!! Thanks so much – and yes it was!